John Sumser talks with Elena Windgate, the Chief Marketing Officer at MosaicTrack, a Seattle-based startup that has pioneered the use of AI for candidate matching based on skill and cultural fit. Prior to Mosaictrack, Elena held positions as a marketing leader in advertising and public relations with companies in the hospitality and retail industries. She holds a degree in Public Relations and Marketing from St. Petersburg University. Elena was named as one of the top women in HR technology worth watching by Recruiting Daily. 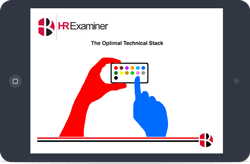 A couple of amazing HR Tech analysts, in the form of Stacey Harris and Bill Kutik, join John Sumser this week to talk about some of the history and trends in HR Technology. John Sumser talks with Jill Witty, the Vice President of Talent & Operations at Entelo. Witty is a speaker at national conferences, on podcasts, and the Entelo blog. She actively volunteers with Stride Center, Glide, 10,000 Degrees, and SF Marin Food Bank. Prior to Entelo, Witty founded three business-to-consumer companies and holds a B.A. from Yale and an M.B.A from UCLA. John Vlastelica is the managing director of Recruiting Toolbox, a consulting and training firm. He is a former recruiting director with Amazon and Expedia, instructor for Recruiting Leadership Labs, co-founder of Talent42 (the national tech recruiting conference), and a highly rated speaker at conferences in the U.S. and Europe. Jeffrey S. Wald is the Co-Founder and President of Work Market, Inc., a web-based platform for managing variable labor resources. Mr, Wald holds an MBA from Harvard University and an MS and BS from Cornell University. Jeff is a regular writer for Huffington Post and Forbes and speaks widely at conferences and television on startups and labor issues.